I am a slow learner. My teachers told my parents that it takes me weeks to learn what other students learn in hours. Younger students can read and write better than me. In my village, my neighbors ask me why I still go to school when I clearly am not academically gifted. Everyone knows this; even I have accepted it. Everything changed when one day, a stranger came to our village. 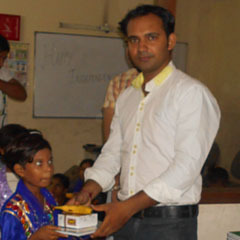 His name is Mr. Harjeet and he was a volunteer teacher from the Harnand Foundation. He spoke to our village leader about the importance of education and how by being educated, you can improve the quality of your life. There was something about Mr. Harjeet that made me feel at ease. He seemed very patient and kind; unlike some of my teachers in school who get impatient when I can’t do math. And when he spoke, his voice is full of compassion. I begged my Mama to send me to the Harnand Foundation to study. When she complained about the costs, I pointed out that they didn’t charge a fee. My Mama was surprised but she finally let me. A week of preparation passed and I made my way to the Harnand Foundation. I sat nervously with many other children. I sat at the very last row, afraid to be called and be exposed as the slow girl that I really am. I have found where I belonged.